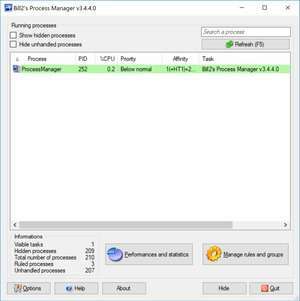 Bill2's Process Manager is a process management application which helps you administer and manage programs and services running on Windows PCs. With Bill2's Process Manager, you are provided with many details about running applications, are are to kill (close) them, change priorities and more. Managing process infinity and priority is one of the main tasks of this program which provides either more or less memory to applications requiring them. Bill2's Process Manager is more geared towards intermediate users as changing process priority can have adverse effects on your system. Version 3.4.4.0 is a freeware program which does not have restrictions and it's free so it doesn't cost anything. For security reasons, you should also check out the Bill2's Process Manager download at LO4D.com which includes virus and malware tests. Additional screenshots of this application download may be available, too.